The Dallas Cowboys are back in offseason mode, concluding their OTAs and minicamp from The Star. With a hiatus until training camp, it was important for several high-profile players to make a strong first impression on the 2018 season. From the start of mini camp, these impressions were left mostly by Rod Marinelli's defense and -- more specifically -- Kris Richard's young group of cornerbacks. Still working through significant change on the offensive side of the ball, the Cowboys did rally on day three under Quarterback Dak Prescott to put out a better performance. The Cowboys coaching staff should love their lasting memories of both FA acquisition Wide Receiver Allen Hurns and rookie Michael Gallup. There is a strong chance that these two receivers will be the Cowboys starters in Oxnard for training camp. We have heard a lot about the impact new WR Coach Sanjay Lal has had on his group, slowing the game down to focus on route running. This will give the team's rotation of unproven receivers a chance with Prescott, as he can focus on throwing to a 'spot' more often. One spot that Prescott has struggled to hit in two seasons as the starter in Dallas is the back of the end zone for fade routes. A red zone go-to under Scott Linehan, free agent WR Dez Bryant was often the intended target on these missed passes. Less of a route running technician and closer to the mold of a physical player like Bryant, Allen Hurns emerging as the Cowboys #1 option would solve a lot of uncertainty at the WR position. 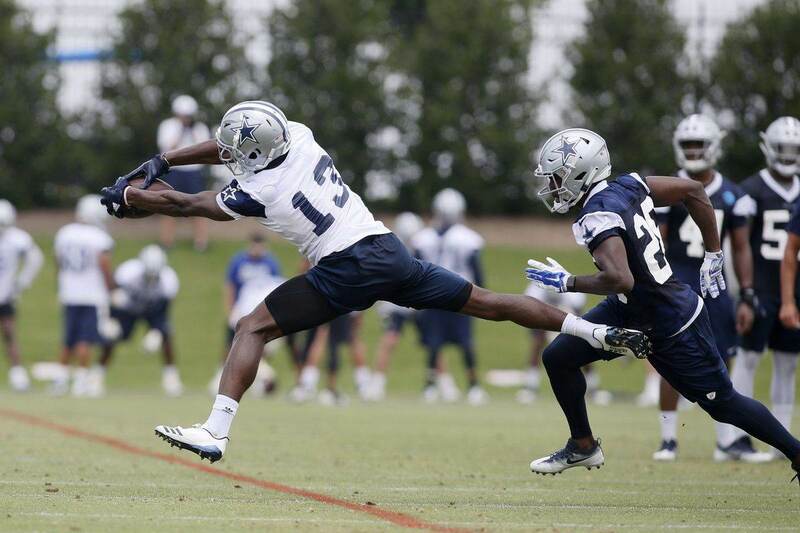 In yesterday's practice, Hurns was able to haul in a perfect ball from Prescott on the fade as he beat Byron Jones. It's going to take some time for Jones to readjust to playing cornerback, but the vision for Kris Richard of him and Chidobe Awuzie starting on the outside is a great one. In a battle of proven players, Hurns got the best of Jones to spark the Cowboys offense at the right time. Overall, there should be no reason to panic about (well, really anything from mini camp) the Cowboys offense right now, and plenty of reasons to be excited about what this defense will develop into. Once the pads come on at training camp, the players the Cowboys are paying to play at an elite level will start to shine, including their newly re-signed Guard Zack Martin -- the highest paid guard in the league now. There are no doubts that the bread and butter for this offense will be handing the ball to Ezekiel Elliott behind this wall of an offensive line. From this increase in competition in the trenches, we'll also get more meaningful battles along the defensive line. In shorts and helmets for now, the Cowboys secondary was given their chance at mini camp, and came out solid early. Another player they've struggled to truly corral though is Michael Gallup. Perhaps pressing a bit thanks to his limited opportunities thus far, Jourdan Lewis was taken across the field by Gallup on a misfire from Cooper Rush. This is nothing new for Gallup however, who's been ahead of the curve on creating the desired separation as a "violent" receiver on the outside. A steal with the 81st overall pick in this year's draft, Gallup has a long way to go in beating out the likes of Terrance Williams, Cedrick Wilson (limited through this portion of the offseason with injuries), and even Cole Beasley, who's received some reps on the outside. With both Hurns and Gallup making plays on the Cowboys final practice until late July, it's easy to let the mind wander with possibilities of the Cowboys offense playing at full strength against a defense that might be up for the challenge better than ever compared to year's past. As always, the practice fields of Oxnard will serve as a battle ground for a young but deep Cowboys team to earn their spots on the 53-man roster, one that surely won't have room for all of the wide receiver hopefuls seen this week in mini camp. Tell us what you think about "Cowboys Offense Finds Rhythm to End Minicamp, Hurns and Gallup Stand Out" in the comments below. You can also email me at Sean.Martin@InsideTheStar.com, or Tweet to me at @SeanMartinNFL! Will Ezekiel Elliott Ever Receive a Long-Term Extension?